You may want to synchronize only a part of your e-mails, contacts, etc. To do this, you can exclude parts of the task. In the upper part of the window, you can see a tree view of your first data storage. 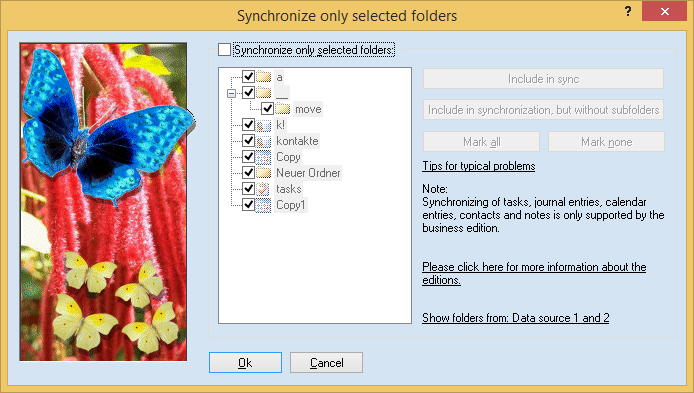 You may manually specify which folders you want to synchronize. Simply remove the checkmarks from the folders you do not want to synchronize. If you exclude a folder, the subfolders will automatically be excluded, too. Note: If you want to sync only a certain type (like only contacts), it's easier to use the type filter.